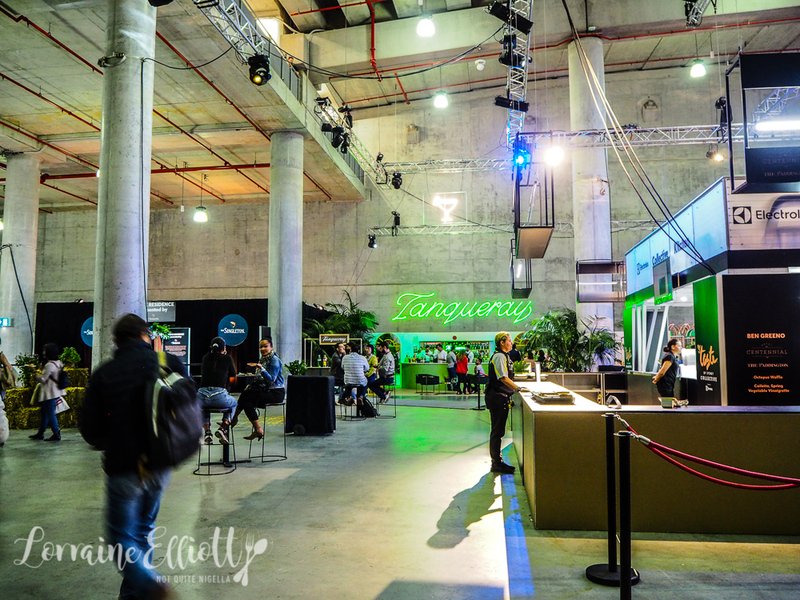 This year the Taste of Sydney food festival moves to Barangaroo's Cutaway. 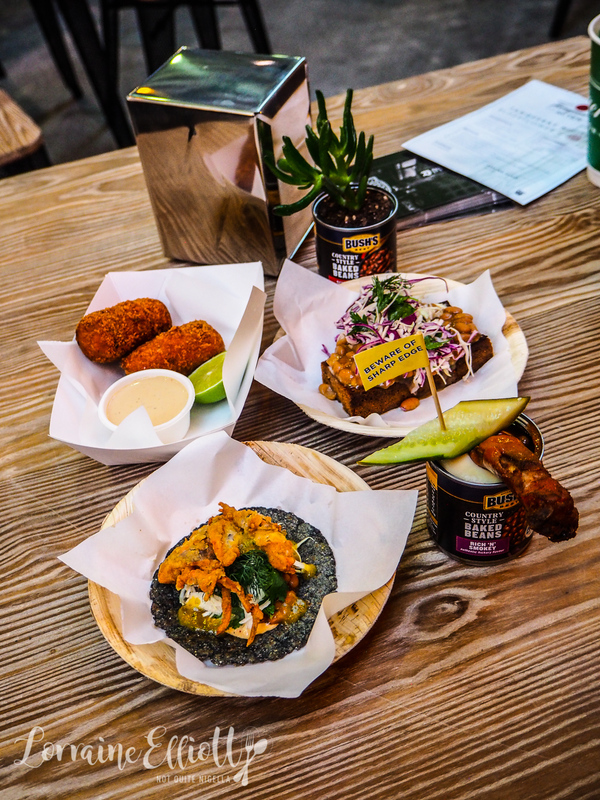 It is now mostly undercover with a revolving range of chefs and dishes across the 4 day festival. 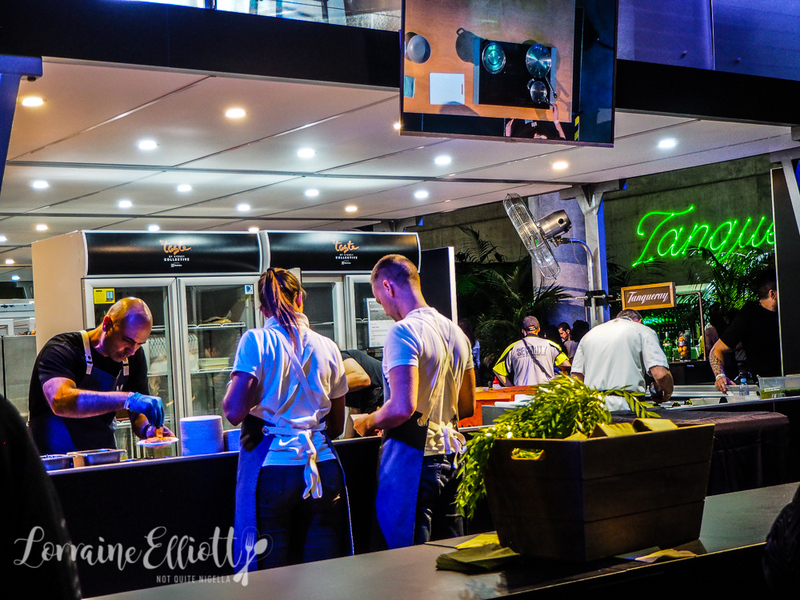 It has been many years since I visited Taste of Sydney. And they seem to have heard the feedback from punters. The general admission price is now $15 and there are no longer the need to buy "crowns" (which would inevitably mean that you'd end up with crowns leftover and you couldn't cash them in). 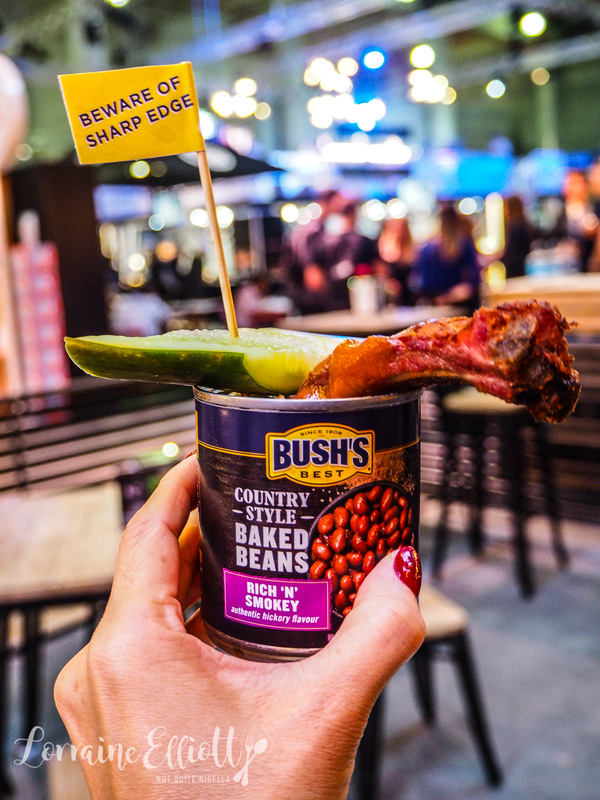 This year's Taste of Sydney is designed so that you may want to come more than once. 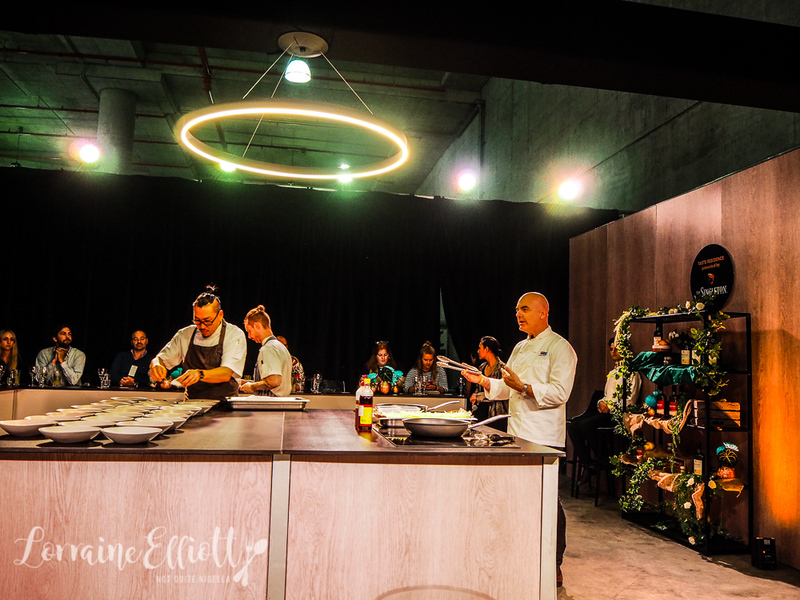 Each day's line up of chefs and their dishes changes although the stallholders around the perimeter and in the centre are there for the duration of the festival. I arrive at 6pm on the opening day. This Thursday there is a mix of Sydney and Melbourne based chefs. My sometime vegetarian friend Laura and I go for a walk around to gauge where we want to eat. There are 8 chefs and restaurants that rotate in the two square shaped collective kitchens in the centre. The lines are manageable and the food comes out in a timely manner for most of them (although this is a relatively quieter night). There are two items from each chef available and each is $12. Our first stop: the Comté donut from Ester which I didn't want to miss out on. It's also the place that has the longest queue. The donut defies description. It's like a potato scallop but light as air. 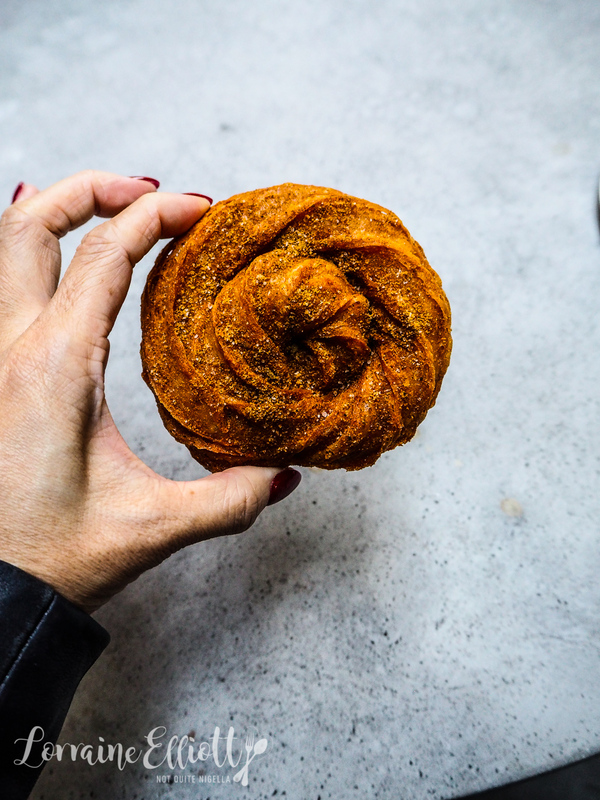 Although the nutty flavour of Comté isn't readily apparent, it's very tasty and so light you could almost convince yourself that you aren't eating a deep fried donut. The next stop is around the corner at Bennelong with chef Rob Cockerill. His choices are a salad of spring asparagus, stracciatella and tomato chutney and a blue swimmer crab congee. Laura and I both love congee so we order this. 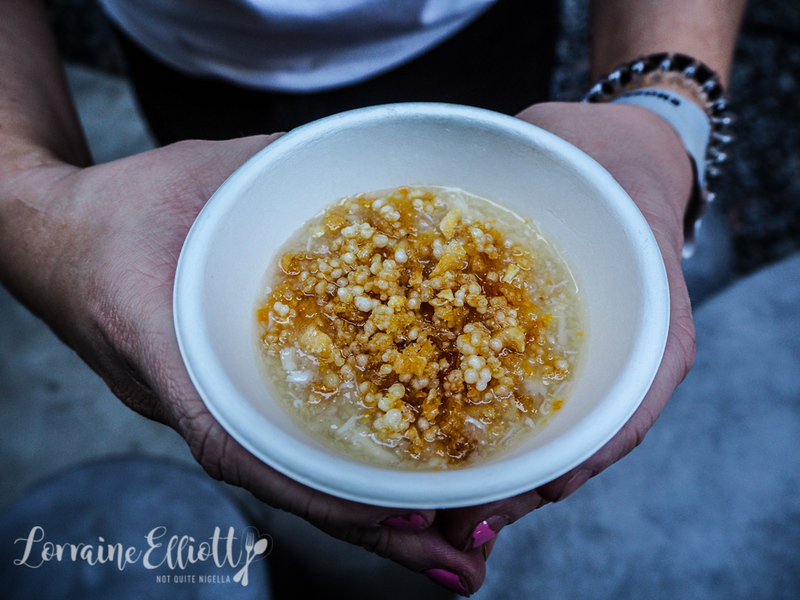 It's delicate and all about soft gelatinous textures with a crunch on top. It's probably the only way you'll get to try a Bennelong dish for that price too. We are off to a cocktail making class next. 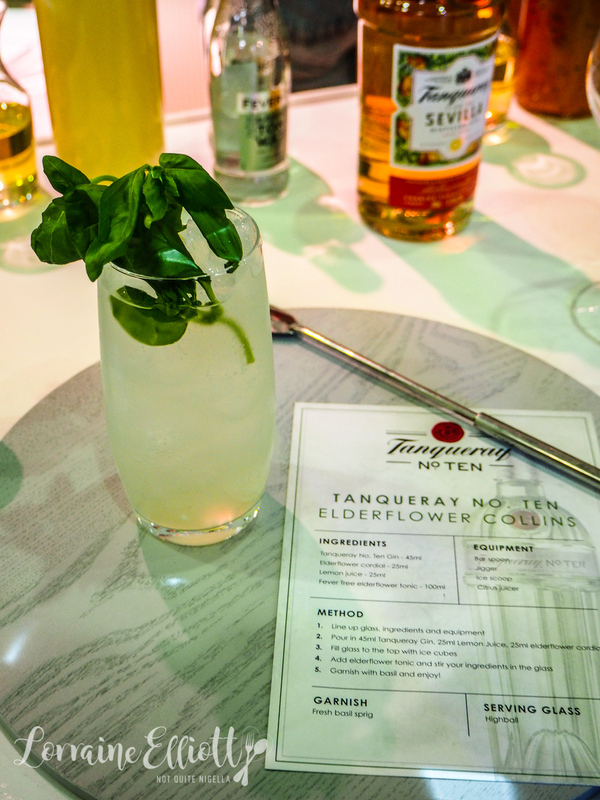 Tanqueray gin has its own cocktail making session where everyone makes one of two cocktails for $12 a person. 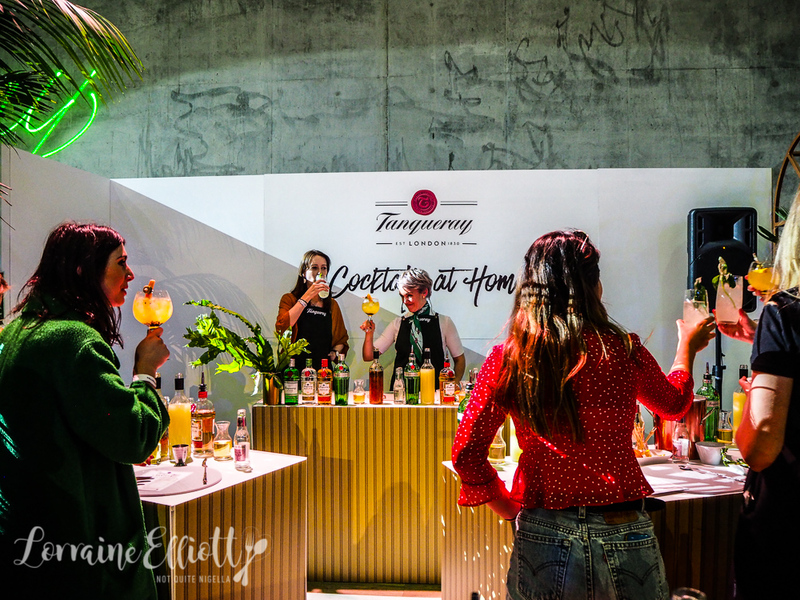 Krystal Hart the Tanquerey ambassador gives us a bit of a chat about the gin before we get our hands wet. I'm making a Tanquerey No. Ten Elderflower Collins finished with basil while Laura makes a Sevilla Sunkissed Spritz. Both cocktails are very easy to make and we both covet the other's cocktail so we swap. "You can put two olives if you want," they say but Laura being extra goes for three. 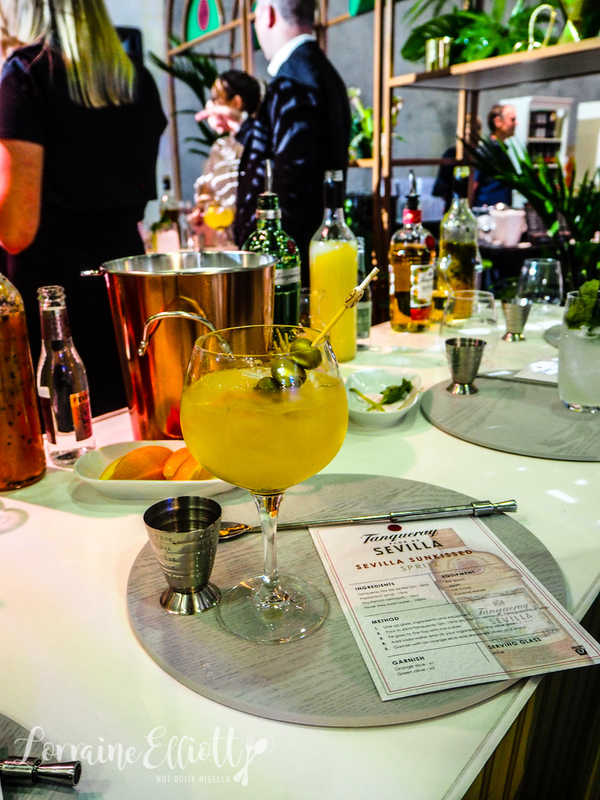 The only thing is that you can't take your cocktail to their gin lounge which is where you want to naturally head after you make it. And if you want to take it away you have to put it in a paper cup which isn't as nice as drinking a cocktail in a nice glass (they are super apologetic and explain this is a Taste of Sydney rule, and not theirs). There does need to be more seating so people can sit down and eat or drink (this has always been a problem here). Carrying our cocktails in paper cups, we are off to Bush's Best Beans next who have partnered with The Nighthawk Diner's Al Fogg to produce four items using their Tennessee beans. They have their own seating area and it's very busy. The four items are: "Beans on toast" aka Southern cornbread with beans, vegetarian Creole jambalaya croquettes with chipotle ranch dipping sauce, a Cola pork rib sticking out of a tin of beans with cheese sauce (beans and cheese sauce-yum!) and a Cajun fried soft-shell crab in a blue corn tortilla. The jambalaya croquettes and the rib in the cheesy beans are my favourite and I wish all beans came with a cheese sauce. 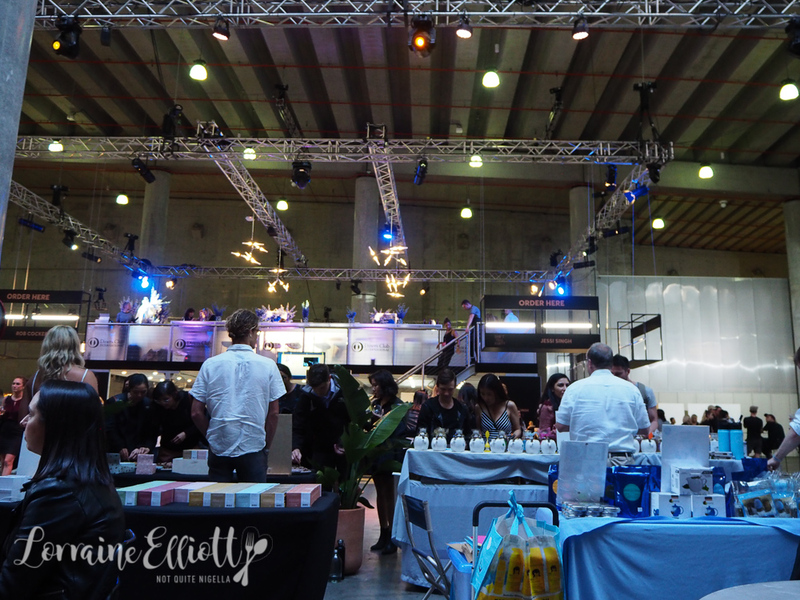 Then we head back to the collective kitchen area and try one of the two Melbourne restaurant offerings. Ides in Collingwood has a barramundi dish baked with sweetcorn and black garlic as well as a slow cooked lamb neck with mustard seed dressing. 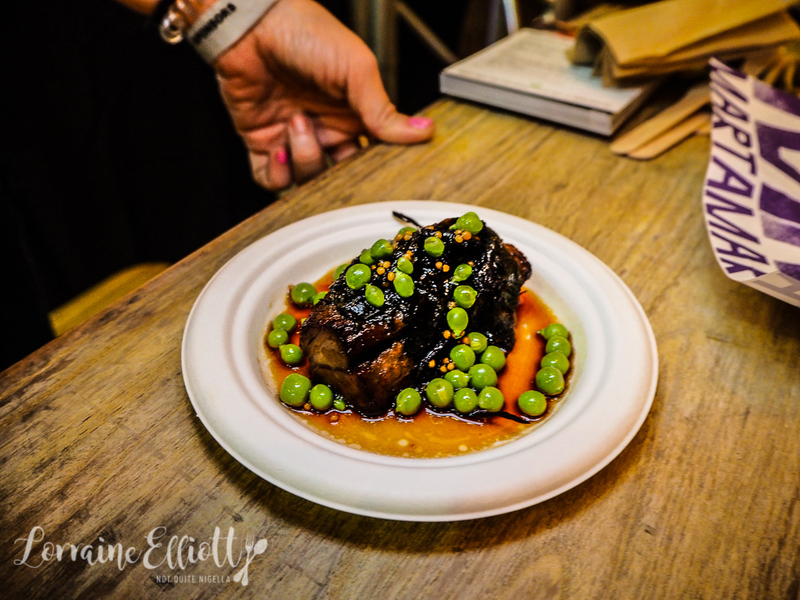 We go for the lamb neck which is gorgeously soft and sweet glazed and topped with fresh peas. Marta is next and there is a bit of a delay with the food as things get busy with the crowd in full force. We've ordered one of each of their dishes. The gnocchi fritto is for Laura since she can't eat the other. 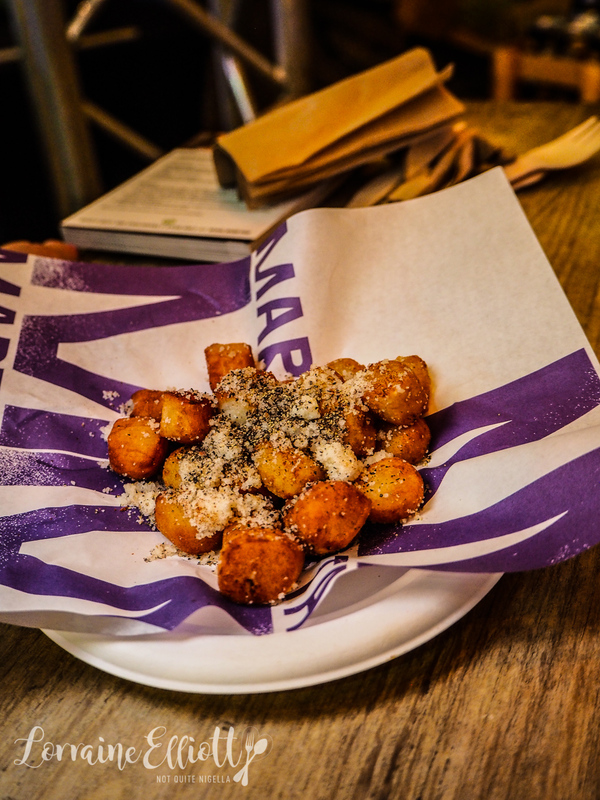 The Gnocchi Fritto are soft pillows of deep fried gnocchi covered in pecorino and black pepper (one of my favourite flavour combinations) that melt in the mouth. 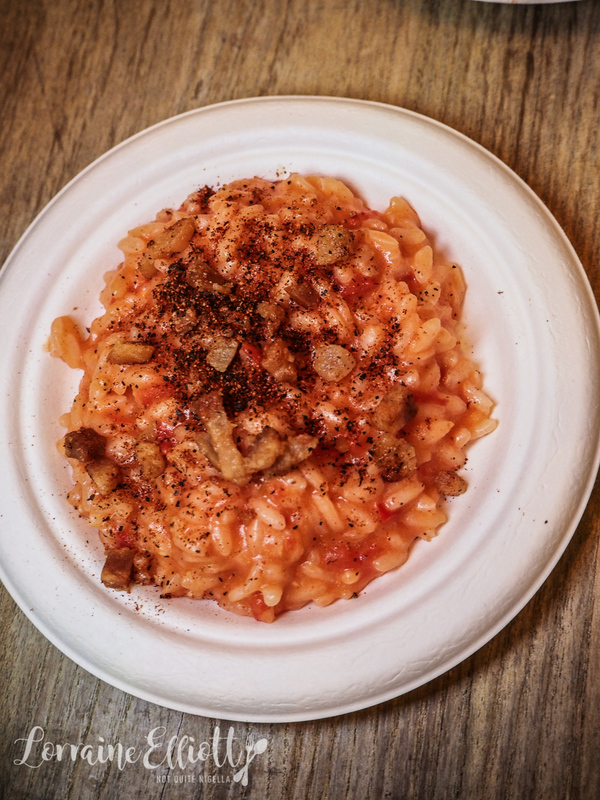 The other item is the Risotto alla Amatriciana, a combination made with one of my favourite classic Roman sauces of Amatriciana with crispy crumbs of guanciale, tomato, chilli and pecorino. This is nice but I always think there needs to be more guanciale because guanciale is life. It's 8pm and time for our next appointment and that is at Taste Residence tent where chef Mark Best and "Cocktailian" Lauren Mote from Canada are serving us a two course meal with matching Singleton whisky for a one hour dinner. MCing is GM of Momofuku Seiobo Kylie Javier Ashton. Mark is cooking on Thursday and Friday and on Saturday it is Scott Pickett while on Sunday it's David Thompson. Tickets are $95 per person or you can also buy the Residence Pass for $130 at the door and that includes festival entry, two $12 dishes and one beer or wine from one of the vendors. There are no menu details so we are excited to see what is being served (although I'm not sure how they handle dietaries). We take a seat and are served a Duke of Dufftown Aperitif made with Singleton whisky, Fino sherry, lemon juice, apple juice, tonic water and Lem-Marrakech bitters that is delightful. 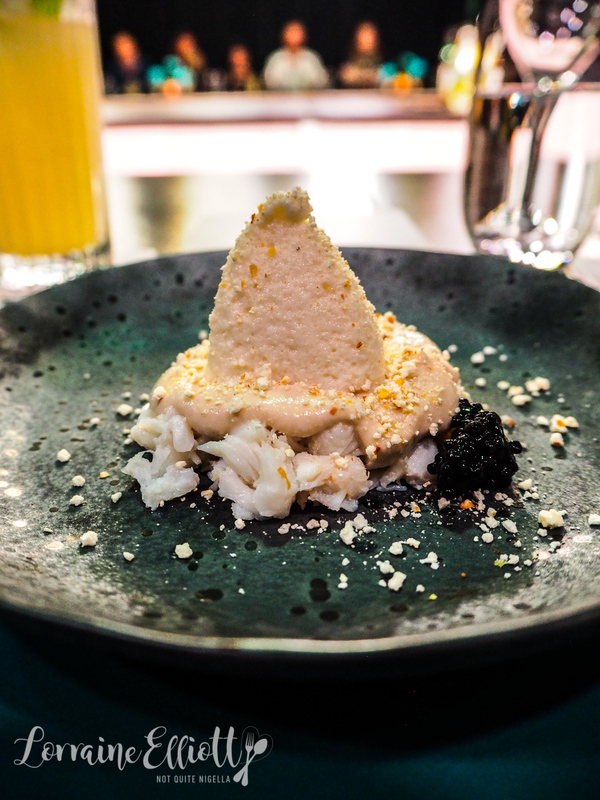 The first dish is crab with almond jelly and corn custard. It's a mild tasting dish more about textures with an almost marshmallowy textured almond jelly and subtle sweetness of corn custard. There's also a bit of caviar for a salty pop. 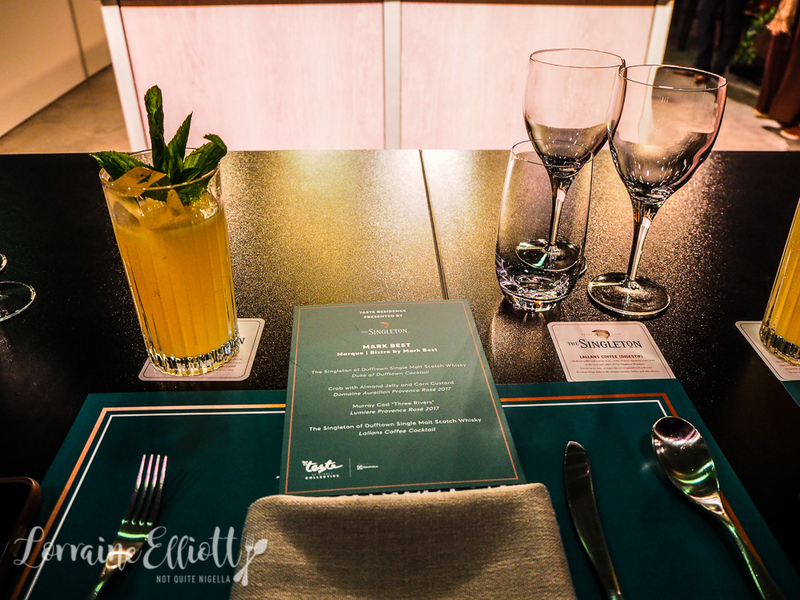 The two courses are also served with two rosés from the Vins de Provence Rosé stand outside. Diners are encouraged to ask Mark some questions and he answers these as well as demoing the next dish. 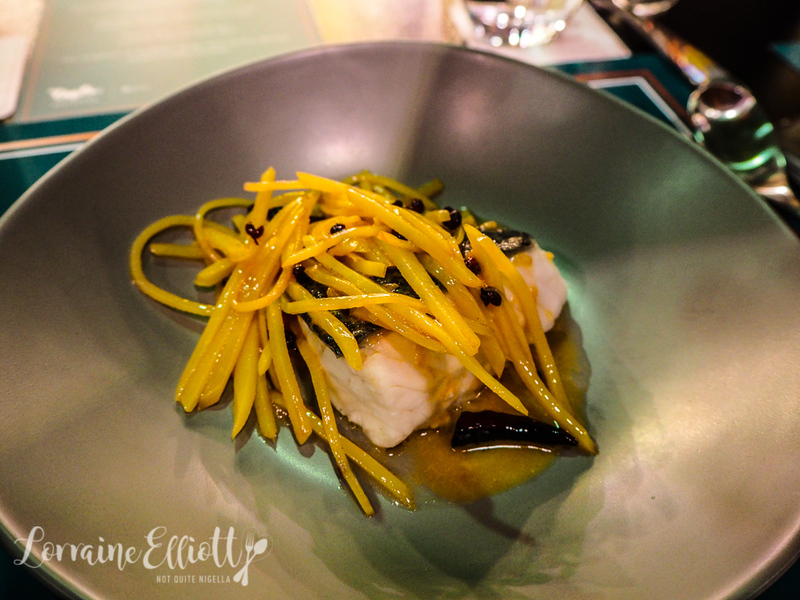 The Murray Cod "Three Rivers" which is a luscious melting fillet of Murray cod topped with semi cooked Chinese style potato straws with Szechuan numbing pepper on top. I like the boldness of this dish and the texture of the potatoes which I haven't really seen much here and have only tried in China. 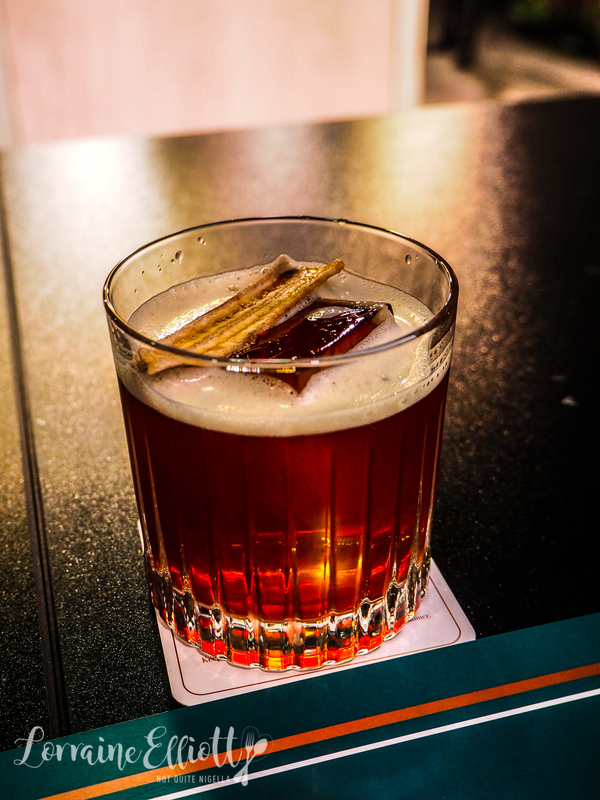 And to top everything off is a dessert cocktail, a Lallans Coffee Cocktail with Singleton Of Dufftown 12 year old whisky, red vermouth, dried banana, banana liqueur, cold brew coffee and Moondog Latin American Bitters which is a sweet, intense number. Most of the stands look like they've run out or are closing down by 9:15pm but we buy a couple of desserts from Stokehouse. 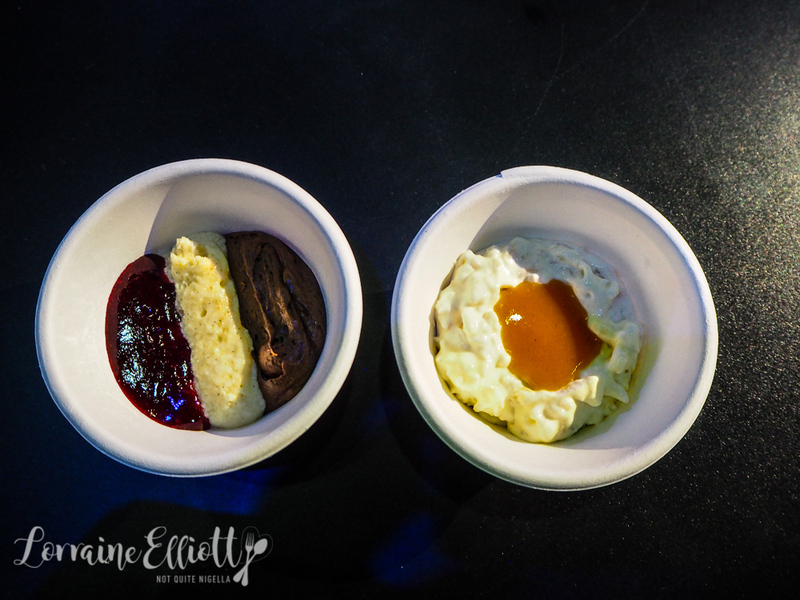 There's a rice pudding made with tonka bean, almond and apricot and a Neapolitan with a chocolate and vanilla mousse and native hibiscus. They're nice enough desserts, the rice pudding the better of the two although I think I was expecting something a bit different. 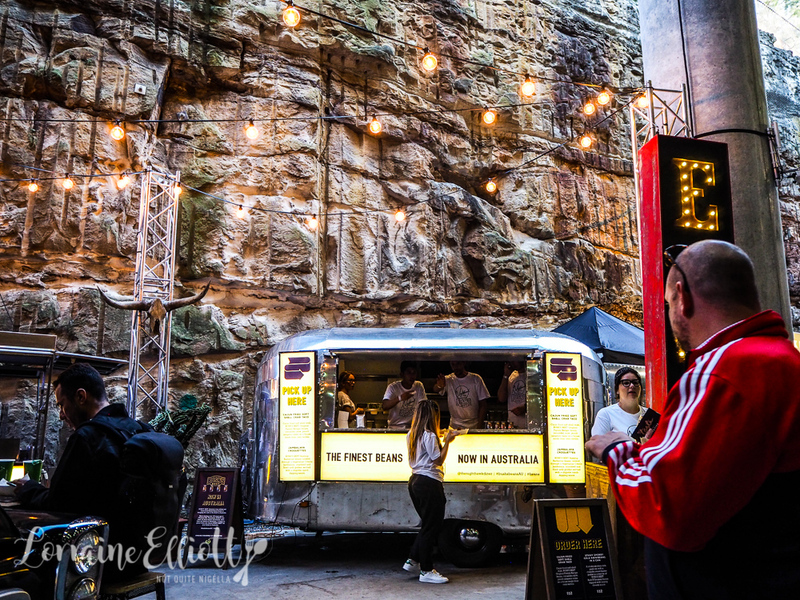 So tell me Dear Reader, have you been to a Taste festival before or Taste of Sydney? Which dish did you like the look of? And do you like it when they revolve chefs and dishes? NQN was a guest of Bush's but all opinions remain her own. restaurantBalls Balls Balls at Sydney Festival!